The first lady was reportedly ‘fighting drugs’ when she beat up Gabriella Engels. 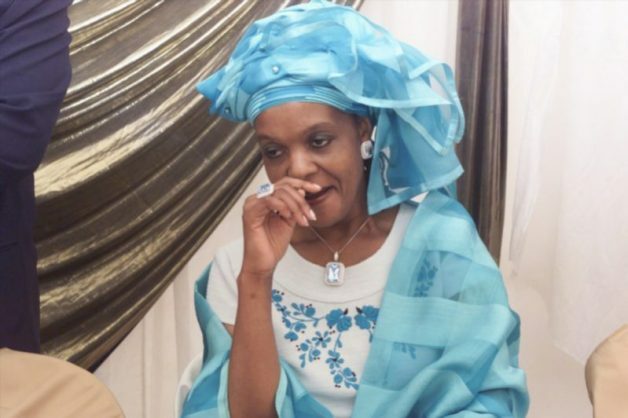 News websites in Zimbabwe have published a report claiming a radically different of what their first lady, Grace Mugabe, had done when she allegedly attacked 20-year-old model Gabriella Engels in Johannesburg. They report that South African police are supposedly in possession of a signed document by Mugabe in which she accuses “a South African-Greek young lady of supplying high-end drugs to her sons”. AfriForum, which is acting on behalf of Engels, has disputed the reports, saying they are false. In the supposed affidavit, Mugabe is apparently claiming that her boys use women as “decoys” to get drugs for them. Zimnews.net and thezimbabwenewslive.com claim Mugabe accuses Engels of just being “a runner” for a “Mr DuPlesis”. Heaping great praise on Mugabe, they further report that – despite evidence she has done no such thing thus far – she “surrendered herself to the police so that this high-clientele drug dealer could be arrested”. They said her attack on Engels was due to her finding her sons “high on drugs while they were in the company of the complainant in a hotel room”. As a result, she apparently went “berserk”. The reports further allege that the reason the boys were moved to South Africa from Dubai was due to their penchant for expensive drugs. Their father, Zimbabwean president Robert Mugabe, “was warned of the likely consequence for them doing drugs in a conservative Islamic country with death penalty”. These reports on a number of websites featuring other news from Zimbabwe have not been corroborated or verified, but may be an attempt by the state to confuse the issue. Alternatively, this may indeed be the version of events that Mugabe has offered the police. On Thursday, Engels and her mother said at a press conference that Mugabe had burst into a room on Sunday night at The Capital 20 West Hotel in Sandton – where she and two other women were sitting – and started hitting them with an extension cord as her bodyguards looked on. The other women decided not to lay any charges against Mugabe. Engels said she had suffered deep cuts to her forehead and the back of her head and, on Monday, she registered a case with the police, alleging assault with intent to do grievous bodily harm. On Tuesday, Grace should have appeared at a Johannesburg police station and, because she was in the country as an ordinary citizen, she could not claim diplomatic immunity. Yesterday, however, she could do so after a request by the Zimbabwe government was timed to coincide with President Robert Mugabe’s arrival at Waterkloof Air Force base in Pretoria. A South African government source confirmed yesterday that Grace would be given immunity, despite the fact that her alleged assault on a Sandton model on Sunday happened when she was on a private visit to South Africa. Advocate Gerrie Nel, of civil rights watchdog AfriForum, announced the organisation’s support for Engels. The support entails, among other things, that Nel will monitor the handling of the case by the South African Police Service (SAPS) and the National Prosecuting Authority (NPA), as well as the implementation of private prosecution should the NPA fail to prosecute Mugabe without good cause. AfriForum said, should diplomatic immunity be granted to Mugabe, AfriForum would be prepared to fight that in the highest court. AfriForum’s Trauma Unit will provide Engels with support to help process the trauma of the assault. Engels was sitting next to her mother, Debbie Engels, during the conference, with a white plaster on her head. AfriForum CEO Kallie Kriel said it was an honour for his organisation to support Engels because she was prepared to take a stand for justice despite enormous pressure.